This badly damaged tin sign was photographed very roughly in a few pieces, and posted for sale on Trademe, quite a while back now. It was all scratched up and smeared with blobs of paint which I removed most of while I was cleaning up the graphic and patching the bits back together. I was kind of taken with the hilarious “Mad Men” feel of the graphics, I guess that it’s not so far-fetched that a woman may fall all over herself for a man because of his snazzy shoes – but usually there’s a little more to it than the kind of fetishistic eyeballing she’s giving his lace-ups, one would hope (like it says, it’s with any luck a second look he’s getting). 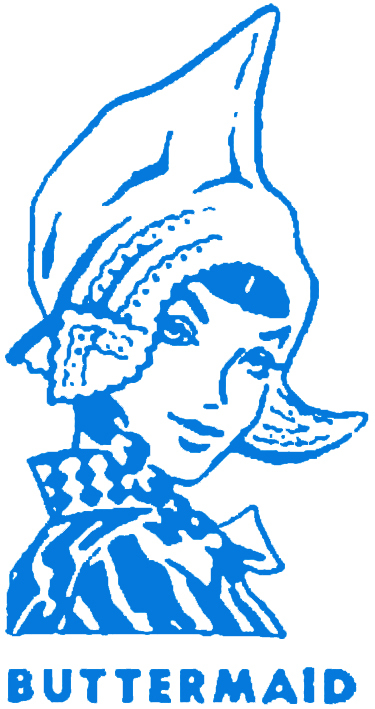 Given her clothes, hairdo and the font styles I’d place this around the mid 1960s, perhaps a touch earlier. However the company had been around for quite some time by then and was considered to be thriving and well successful. Michael O’Brien was an Irishman who learned boot-making there before arriving in Melbourne in 1861, and after a year relocated to New Zealand. the business was established in 1884 (I don’t know why it took him over twenty years to start up on his own, or what happened in between), starting off in a premises that was known as the “Skating Rink” . Great name – I’d love a little more detail on the back story behind this! The ad here is from 1884 in the year the business launched .In 1902 due to massive growth he re-established the business in Dundas Street , Greymouth. According to the “The Cyclopedia of New Zealand” of 1903, “The factory of this important business stands on a well-chosen site close to the Christchurch railway station. The premises are of two stories solidly constructed of brick, erected on the most modern and up-to-date lines. In the words of the Government Factory Inspector, the factory is “one of the best model factories in the colony. “ It recounts the premises, operations and manufacturing process in great detail. Big bikkies was their own “Premier Brand” footwear, “Remington” Bicycles, Their own patented “Viscol” waterproofing liquid, a variety of imports such as Wellingtons – the now ubiquitous “gumboot”. By the time the (second) Boer War was underway they had a government contract to supply boots. From this postcard and these later photographs of the plant in the 1940’s, the business was considered a landmark of importance for a tourist brochure – and by then we can see they were pumping out their own rubber products such as soles, gumboots, and possibly bicycle tyres, (but no connection to Continental Tyres) on site. Of the Continental brand from the sign, not much is known at present, however I have a feeling I remember them being around in the 1970s as a popular dress shoe. A record I’ve found of someone having worked for them as an accountant shows that M. O’Brien & Co Ltd survived well into the 1980s, and from there it can be assumed they were swallowed by another larger concern, perhaps Clarks, Dunlop, Bata or Skellerup – and phased out. I am sure there will be more to this story in future, especially once I can investigate trademarks a bit more, however although the “Premier” brand was registered, it doesn’t seem “Continental” ever was. In the meantime I marvel once again how a random, grungy image can lead me on a whole journey! 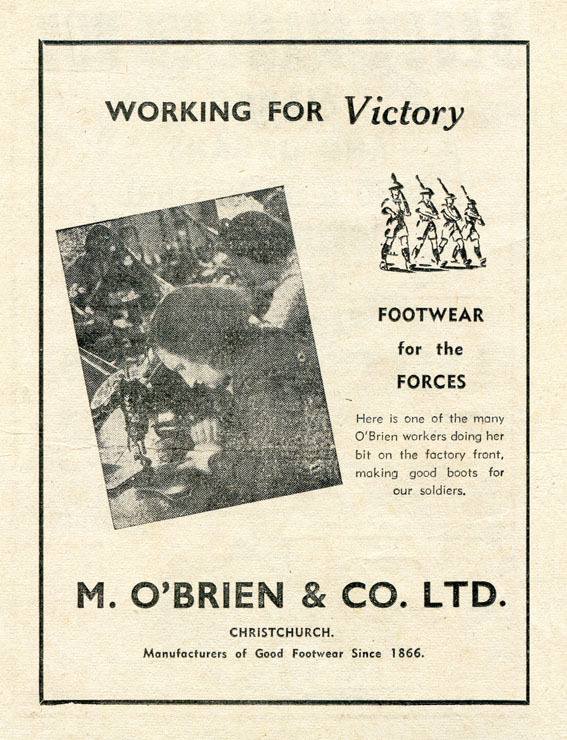 Addendum, early Aug 2013: I found this ad in The New Zealand Dairy Exporter, of March 1943, regarding O’Brien & Co’s government contracts to make boots for the armed forces also for WWII. No doubt they also performed this work during the First World War. 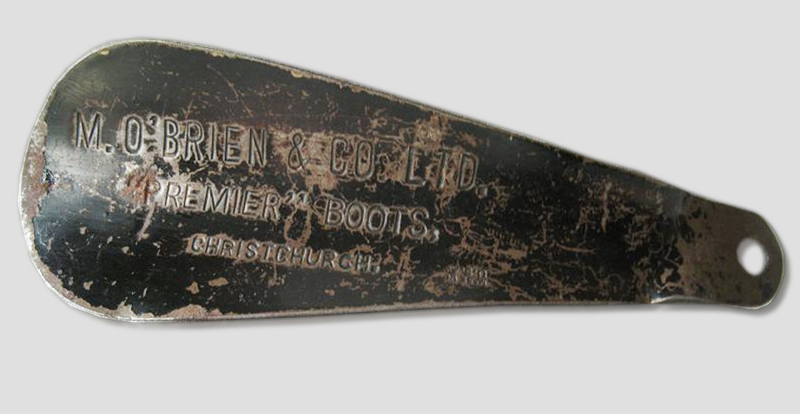 Addendum, late June 2014: This M. O’Brien & Co promotional shoe horn turned up for sale at auction recently. I’m not sure if “Premier Boots” was a brand, but I don’t think so – probably used as an adjective. 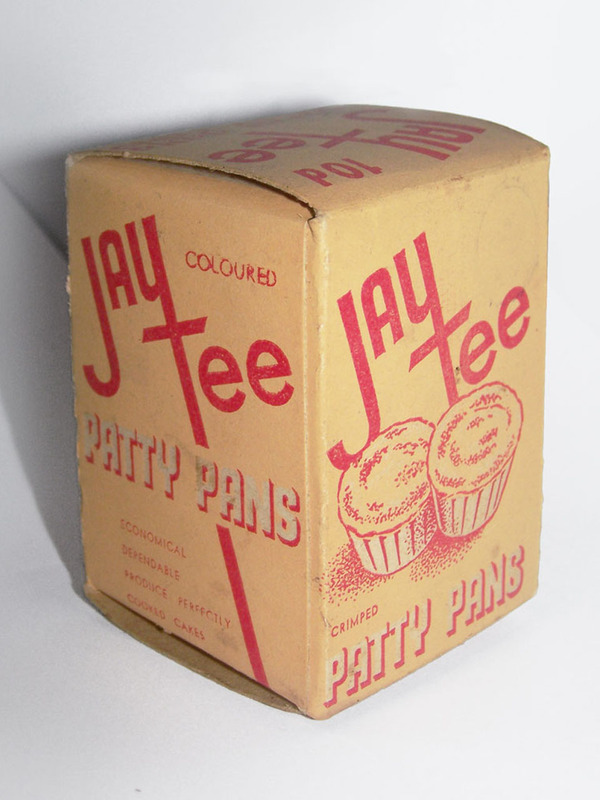 I bought a Jaytee Patty Pans box a while ago and it just arrived yesterday. So many great kitchen memories. I think kids obsess on baking cups because it means one of several things; and they’re all good (debatable), sugary things! well that is just an assumption to explain my fixation, anyway. My latest purchase is pre-decimal (designed with a to-retail pice of 10 pence printed on the box). Produced before 1967, I estimate late 1950s to early 1960s. I can date this one between 1964- 1967 because it came from the family kitchen and it’s pre-decimal (marked with a price of 13 pence). Mum wouldn’t have any reason to buy baking cups before she moved into the matrimonial home. I thought the box was empty when I bought it, especially as I had asked for it to be flattened for postage… but it actually had the red wax paper and all the patty pans still inside, unused. The fact is that smell is the strongest sense linked to memory, and every time I open it and take a sniff, whoa! – it smells EXACTLY like Mum in the kitchen making Chocolate Crackles. It transports me right back there like I am standing in the kitchen of the family home. That’s the power of nostalgia, folks! But it does make one wonder. How much of the smell that I remember was actual Chocolate Crackles? And how much was the actual patty pans? Seems like it was the latter in all honesty. It’s sort of like finding out late in life you were adopted. It’s a unique combo scent of paper, wax and vanilla that does not smell like anything else, I wonder if they scented them specifically? On the left post 1979, as McMeeking have taken ownership. I estimate early 1980s. On the right, I estimate early-mid 1970s as the founder is still specified. Both boxes nicked from the family kitchen in the late eighties. 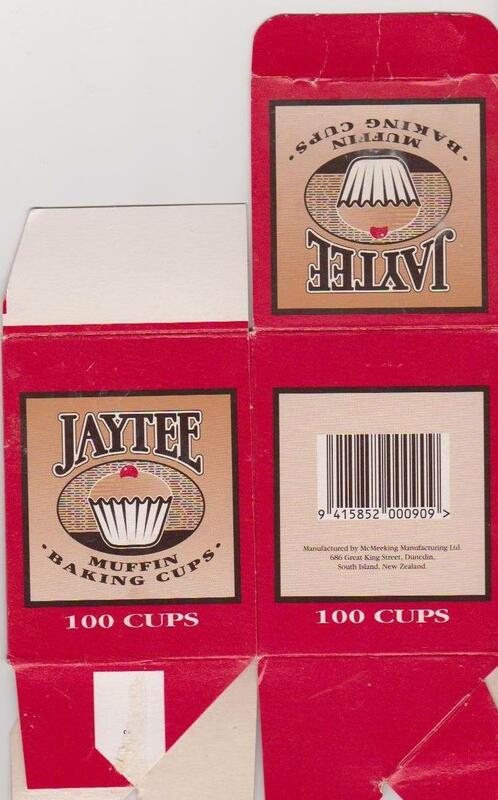 Jaytee Baking Cups have been a household name since the 1930’s, when the company was founded by a printing engineer, James Thomas Williamson. Hence the name Jaytee. Since acquiring the company in 1979 McMeeking Manufacturing has been the largest supplier of Baking Cups in New Zealand with exports to Australia and the Pacific Islands. McMeeking still own it today, running the operation from Dunedin, Otago. Because I have this information it’s easy for me to get a ballpark date on these boxes combined with the probability of purchases influenced by my parents setting up house and us children being born (the likelihood of making cupcakes before you have squalling toddlers is pretty unlikely, after all – bake sales aside, who does stuff they don’t have to when they know they have twenty non-stop years of it in the near future?). The last image above are some modern designs from the company, produced within the last few years. You can still see remnants of the original box design as it’s morphed over the years. Addendum mid Jan 2014: A Dunedin collector and reader of this blog kindly sent these images to me as a contribution the article. These arrived some months ago and I haven’t had time for quite a while to do all the updates I need to get around to. I’d say these two boxes date from the 2000s, and are still made by McMeeking in Dunedin. There can’t be too many things that are still made domestically these days. 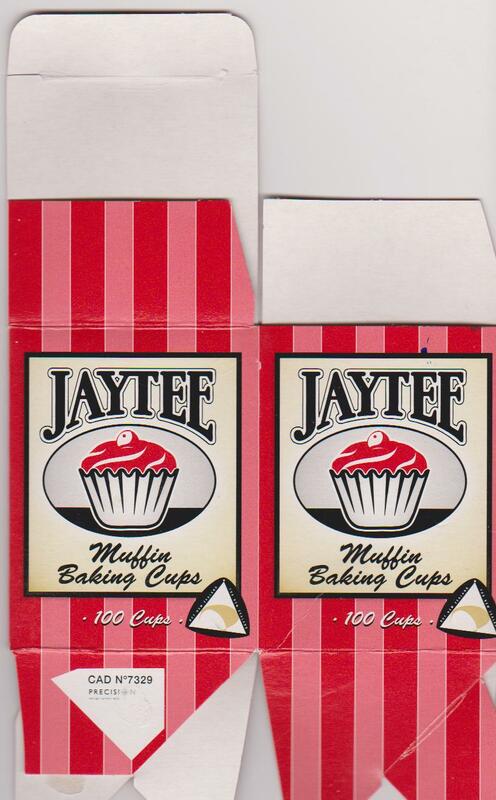 It just occurred to me that I’ve never seen any advertising at all for Jaytee. That’s quite unusual for a steadfast kitchen product that has been around for some decades. Both following images are courtesy of Owain Morris collection. 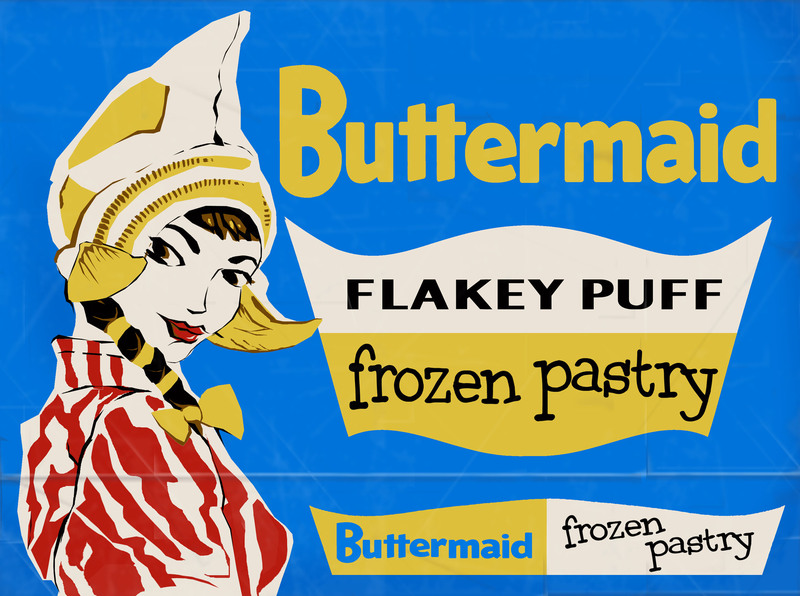 I’ve been obsessed with this Buttermaid box for a while, it’s such a neat design with it’s bold, simple graphics. It’s yet another recreation on my list I have been trying to get finished in between working hard on other things. 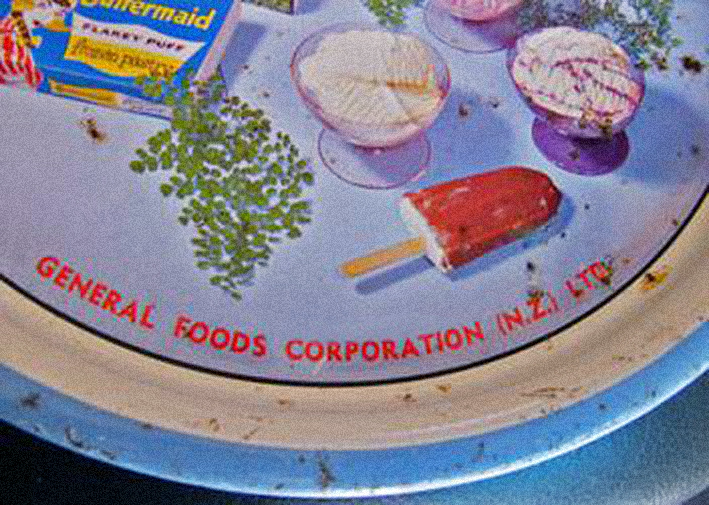 Buttermaid is featured amongst an array of products on a promotional tray by General Foods Corporation, who have controlled several major brands over the years. A give-away to clients and vendors I presume, and at this point in time – I’m guessing mid to late 1960s by the look of it – they are producing Tip-Top, Wattie’s, and as far as I recall, Buttermaid was originally an Irvine product (pre-baked pies and pastries). I definitely remember these tubs of fruit salad ice cream – the packaging had not changed into the early 1970s; and the cardboard icecream boxes were pretty similar too, however what I can recall as a youngster is that Buttermaid packaging was plastic, and had been revised, I think the blue was gone and replaced with a brown Hessian texture that, coinciding with the era of the Summer of Love – screamed hippie instead of it’s intended barnyard heaven. I had screen grabs of a few different General Foods promo trays that have come up for sale online over the last couple of years – but none of them have been particularly good to work from so it’s been a lot of squinting and trial to get it right. The photos I have lifted the recreation source material off are very low res, bad quality images – and as yet no-one ever seems to capture a close up of the whole object. So one had most of the top of the box, the other showed the bottom and I’ve had to put them back together to start reconstructing the design. They currently have this version registered (just for the sake of it I would say, because I don’t think she’s been let out of the proverbial farmhouse for a long time now). To me the style of this one looks like an even fussier, older version that has been dragged out of a dusty file so they can slap a claim on it as quickly as possible. Or is it a more 1970s look? Even hard to tell for me. Regardless, it doesn’t look like this unfortunate sleeping beauty shall be arising any time soon. This is about as much of a revival as she’s going to get.